Henderson has held a number of positions at the Ransom Center, including research librarian and associate librarian for manuscripts public service. In her current position as associate director, she oversees the planning and development of exhibitions at the Ransom Center. Help the Ransom Center plan an exhibition about design by answering the questions in this survey. The survey should take about 15 minutes to complete. 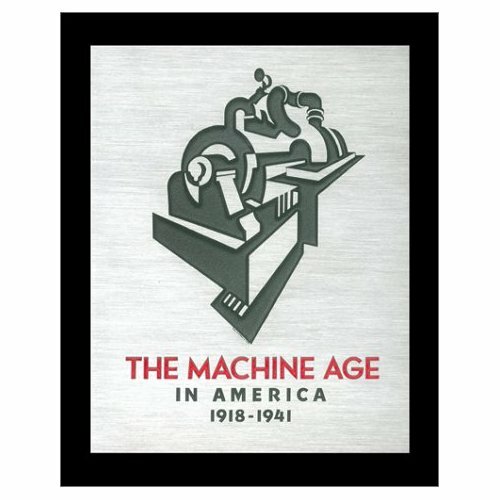 Those who complete the survey will be entered into a drawing to receive a first edition of The Brooklyn Museum of Art’s exhibition catalogue The Machine Age in America, 1918-1941. Anthony and Bertram Rota. Photo courtesy of Bertram Rota Booksellers. The Ransom Center notes with great sorrow the death of Anthony Bertram Rota on December 13, 2009. 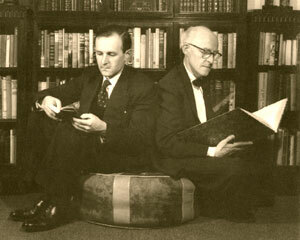 As managing director and chairman of Bertram Rota Ltd, the London-based antiquarian bookseller was greatly influential in shaping the Center’s renowned holdings of the papers of numerous nineteenth, twentieth, and twenty-first–century British writers. Over a succession of five Ransom Center directors, the firm sold more than 500 collections to the Center, including the personal papers of several writing dynasties, notably those of Edith, Osbert, and Sacheverell Sitwell, and Theodore Francis, Llewellyn, and John Cowper Powys. In his memoir, Books in the Blood (Oak Knoll Press, 2002), Anthony Rota recalled his annual travels to the United States: “In a two or three-week trip I would visit between seven and ten university libraries, sometimes speaking to gatherings of professional staff and sometimes talking to students who were English majors. . . I went to New York and to Austin each year. I always arranged for my time in Texas to fall so that it covered a weekend, for I soon had many friends in town and I liked the outdoor lifestyle that they followed.” His annual visits were as eagerly anticipated by Ransom Center staff; occasions for barbeque and margaritas as much as for books and manuscripts. Generous with his time and expertise, Anthony Rota taught generations of rare book librarian professionals the craft of modern collecting through courses at the Rare Book School, presentations at professional conferences, and by example. The firm’s collection descriptions are models of clarity and precision; miniature literary histories tracking the creative process. His legacy of enriched research collections benefits scholarship and ensures a greater understanding of a shared culture.